“Up, up! Lift your swords to the music. Don't be afraid to depend on one another. Morris is about leaping. Shake those bells! I have taught traditional dance at WSCC since 2010, but have danced all my life. Moving to music lifts the spirit and feeds the soul, as well as exercising the body. Dancing as a group sharpens the feeling for teamwork and common goals. Tradition deepens a sense of communal history, while exploring dance styles from other cultures broadens horizons. Authentic costumes and implements add color, sound and vitality as well as purpose and meaning. All of these elements are explored in dance classes, and shared in assembly performances. The tradition of Morris dancing dates back to the 12th century. Once popular in many areas of Europe, it took hold in England in pre-Elizabethan times, evolving from court entertainment to stage performance to rural pastime. Outmoded by the industrial revolution, it was revived by the work of folklorists who notated tunes and steps from elderly ex-dancers. Today it thrives across the English-speaking world and beyond. We are also exploring two styles of Sword dance from northern England: Longsword and Rapper. Longsword, from Yorkshire, emphasizes smooth and mesmerizing movements, as dancers move under and over wooden swords before weaving them into a star or “lock.” In this exacting tradition we explore the true meaning of teamwork, since every movement depends on all dancers working together. As part of a traditional Mummers play, the duty of the dancers is to cut down winter in the guise of Saint George, who willingly accepts his ritual beheading and is eventually revived as spring. The sword dance literally makes the seasons turn! Rapper sword is the youngest tradition, about two centuries old. This fast-paced and complex form fits well on young bodies, requiring lightning-quick movements and strong, clean tapping steps. The swords, made of flexible steel with a swivel handle, evolved from mine workers' tools in the far north of England. Rapper is alive and well in America, with young teams sprouting up everywhere and competing in national and international tournaments. Several Waldorf graduates have gone on to join established Rapper teams. In class we balance the intensity of Morris and Sword with rhythm games and social dances from around the world. We have learned dances from across Europe as well as Russia, the US and Africa. Exploring movement traditions and music from other cultures can be physically challenging, but is also fun and allows for social interactions. Handclapping, miming nonsense syllables, “sleepwalking” and changing partners are all part of our journey through the world of dance. As the children become more experienced, their enjoyment increases. There is nothing more satisfying than seeing smiles on their faces by the end of class, or hearing requests for particular dances. Long may the Waldorf tradition continue! The winds blow cold reminding us all that the chill of winter is coming. The days continue to darken and so we begin to bank the fires of our home life that will help nurture us through the dark winter’s cold. Advent is approaching: a time for inner preparation as we look forward to kindling the inner light that glows within us all. At the Waldorf School of Cape Cod as well as in many other Waldorf schools there is a tradition of the Advent Spiral. It helps us to prepare for the peaceful celebration of the winter festivals (Christmas among others). The Advent spiral began in the 1920s when a curative nurse brought it into a group home dedicated to the care of children with disabilities. She had been inspired by the custom from long ago in Bavaria, where farmers would bring moss and twigs into their homes and fashion a garden on a table, which was lit with candles in apples. For them it was an expression of an old parable of Paradise. 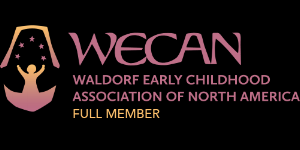 Later the festival was brought to Waldorf Schools all over the world. 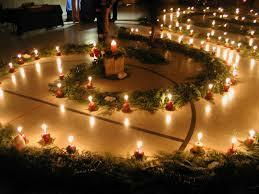 Evergreen boughs (a symbol of life everlasting) are placed in a spiral form on the floor with a large candle in its center. The room is darkened and the mood is peaceful. The spiral begins; one at a time each child walks into the spiral with a lantern in which sits an unlit candle. They walk with or without help from teachers and or parents depending on their needs and make their way to the spiral’s center. There they find the large lighted candle and from it light their own. They place their lantern with care and with help if needed somewhere along the spiral’s path and then they walk their way back to their seat. The experience of the Advent spiral reflects the human experience at this time of the year; entering a time of darkness, of shorter days and longer nights and going forward with hope to welcome the light of the sun after the winter solstice.